There are many ways that a reader can physically alter a text. In Figure 1 we see five distinct features of reading engagement: underlining, circling, bracketing, commentary, and nota marks. Notably, each feature reveals a consistent logic of the reader for its existence; that is, each feature is significant and meaningful. The unidentified reader of this text circles authors and key terms, underlines important quotations, and stars what they consider to be the most significant passages. It is possible to reveal reading practices and even a reader's reception of a text by examining the features left behind by a reader. The remainder of this post will examine two of these features, marginal commentary and erasure, and assess how they can inform scholars about medieval reading practices and engagement. Fig. 2: Cotton Cleopatra D.ix, fol. 138v, detail. British Library, Cotton Cleopatra MS D.ix is a miscellany likely bound by Robert Cotton. It contains several different texts, one of which is the South English Legendary account of the Life of Thomas Becket. 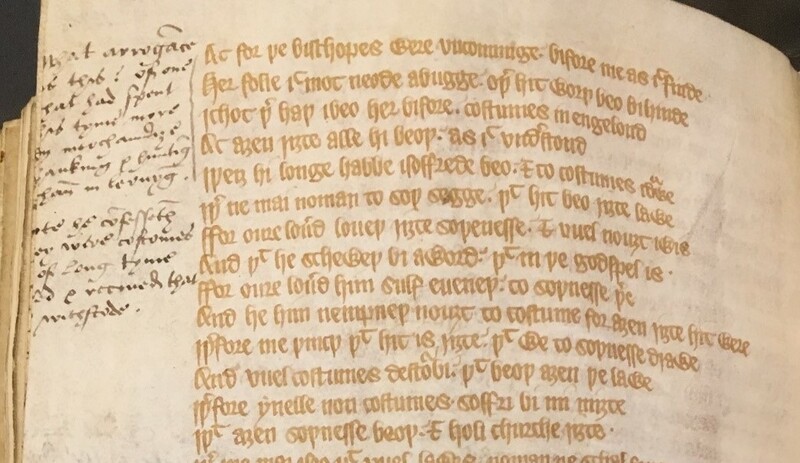 As Hannah Kilpatrick notes, this manuscript came into the possession of Sir John Prise, one man responsible for overseeing the dissolution of the monasteries in the 1530s. His marginal commentary in the account of Thomas Becket reveals his personal attitude towards Becket as a historical figure and religious icon. In the margins of the manuscript Prise writes: “What arrogance is this! Of one that had spent his tyme more in merchandize hauking and hunting than in lernyng” (Fig. 2; fol. 138v). According to Ker, the marginalia composed by Prise are “numerous, strongly protestant and anti-Becket” (Ker 21). This is to be expected given his role of shutting down monasteries and given that his employer was Thomas Cromwell. Without detailing the historical significance of sixteenth-century attitudes towards Thomas Becket, it is important to remember that Becket represented papal authority and dissent—two things that Henry VIII was keen to suppress. Extant manuscripts annotated in Prise’s handwriting number in the hundreds. He is known to have collected monastic historical texts. Huw Pryce writes of Prise: “In his will he urged his son Richard to arrange for the publication of the works of William of Malmesbury and other medieval historians in his collection” (ODNB). Prise’s concern for the dissemination of medieval historical sources is interesting because the account of Thomas Becket is, in part, historical, even if his commentary does not demonstrate modern expectations that historians should be disinterested scholars. Nevertheless, Prise's commentary leaves material evidence of sixteenth-century attitudes towards Thomas Becket and is one of many examples of this manuscript’s and this text’s reception. Fig. 3: Bodleian Library, Laud Misc. MS 463, fol. 1v, detail Modern archival hand rewrites Thomas into the line. Another feature found in Cotton Cleopatra D.ix is erasure. Erasure is a common feature in manuscripts where an aspect of the text is either crossed out or scraped from the leaf. Erasure of Thomas Becket's name from manuscripts was frequent following the formation of the Church of England in the 1530s. Also in Cotton Cleopatra D.ix is a chronicle from Gloucestershire. This document likely came into the hands of Robert Cotton through Sir John Prise at the same time as the Life of Thomas Becket. Typically, Thomas Becket erasure involved the complete deletion of Thomas’ name from a text, as can be seen in Figures 3, 4, and 5. However, in this chronicle, it is not his name which is erased, but his designation as a saint (see Fig 6). This is significant because this erasure is not an act of historical revisionism, just a reflection of historical attitudes. That is, this act of erasure does not remove Thomas from his historical context, just his status as a saint. Fig. 4: British Library MS Stowe 22, fol. 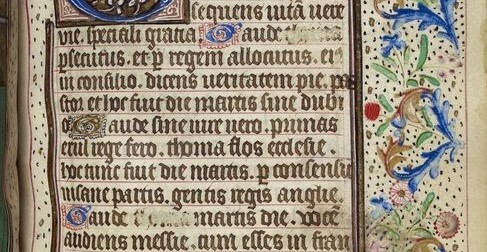 25v detail: erasure of Thomas's name from text. Fig. 5: British Library MS Royal 2 B. vii, fol. 83r, detail: erasure of Thomas Becket from his feast day. Fig. 6: British Library MS Cotton Cleopatra D.ix, fol. 80r, detail. 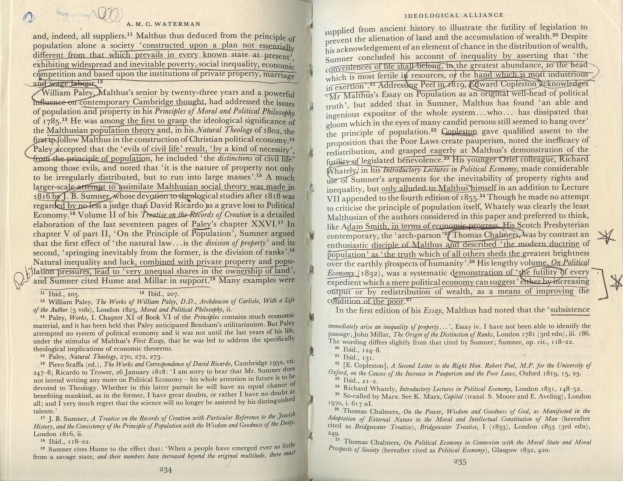 Both features described here, commentary and erasure, reveal the attitudes of readers toward texts. But beyond their description, how can scholars use them to further study manuscripts and medieval reading practices? Many of the possible conclusions drawn by analyzing reader-inscribed features such as commentary and erasure rely on informed speculation. To an extent, these speculations can be useful for witnessing how past readers have engaged with texts. There are important limitations, however. Scholars cannot generalize about audiences based on specific examples of reception. For example, to return to Cotton Cleopatra D.ix, it would be problematic to claim, with such a small sample size of evidence, that sixteenth-century readers generally read the Life of Thomas Becket derisively. What we can argue, however, is that there is evidence of negative attitudes towards Thomas Becket within the upper echelons of Henry VIII’s administration. While overt documentary evidence already exists that demonstrates Henry VIII’s derisive attitude towards Thomas Becket, the evidence found in Cotton Cleopatra D.ix simply reinforces our understanding of these attitudes. Finally, since erasure is normally an anonymous act, it is impossible, with the manuscript described here, to know who specifically performed the act. Nevertheless, the type of erasure associated with Becket’s name in Cotton Cleopatra D.ix was common in the sixteenth century; for example, a proclamation of November 16th, 1538, commanded the erasure and destruction of words and images representing Saint Thomas from all facets of religious devotion. 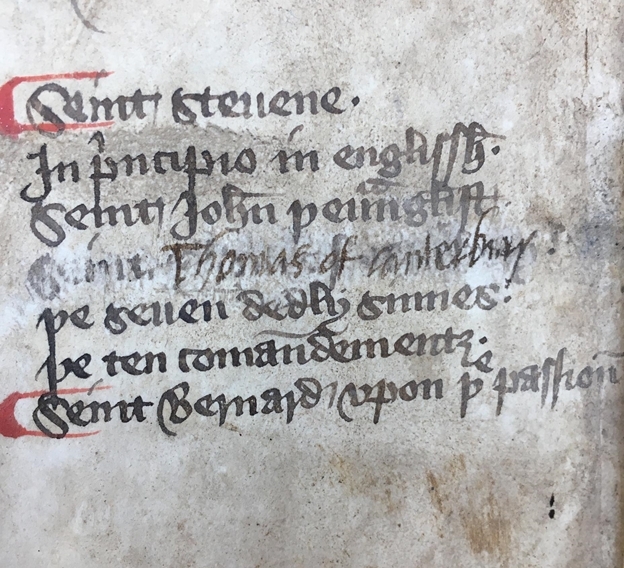 For further reading on Thomas Becket erasure, the British Library medieval manuscripts blog has a general introduction to the concept and manuscript evidence. "Henry VIII: November 1538 16-20." Letters and Papers, Foreign and Domestic, Henry VIII, Volume 13 Part 2, August-December 1538. Ed. James Gairdner. London: Her Majesty's Stationery Office, 1893. 353-369. British History Online. Web. 19 October 2017. http://www.british-history.ac.uk/letters-papers-hen8/vol13/no2/pp353-369. Ker, Neil R. “Sir John Prise,” The Library 5th Series 10 (1955): 1-24. Pryce, Huw. ‘Prise, Sir John [Syr Siôn ap Rhys] (1501/2–1555)’, Oxford Dictionary of National Biography, Oxford University Press, 2004; online edn, Jan 2008 [http://www.oxforddnb.com/view/article/22752, accessed 20 Oct 2017]. Figures 4 and 5 provided and made freely available by the British Library. All other images in this post are by Tristan B. Taylor, with thanks to the University of Saskatchewan, the British Library, and the Bodleian Library for access to their collections. For more information on this manuscript, see Hannah Kilpatrick's series of great blogposts exploring the origin of this manuscript: http://ceirseach.blogspot.ca/2009/12/study-of-cleopatra-d-ix-introduction.html. Both this post and Kilpatrick's post share a great deal but with different goals in mind: she is providing a comprehensive detailed bibliographic description while this post attempts to put to use her findings to reveal reception through physical evidence supplemented by historical evidence.